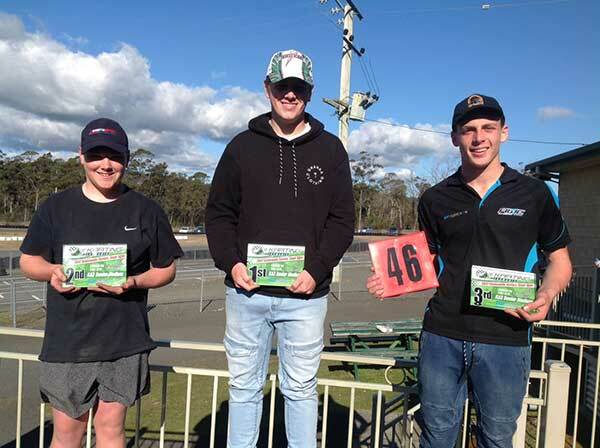 The Launceston Kart Club hosted the final round of the Spreyton Fresh – AWC Motorsport Academy sponsored statewide series over the weekend. With sunny conditions on both days, the action was fast and furious for the coveted red plates that were on offer. 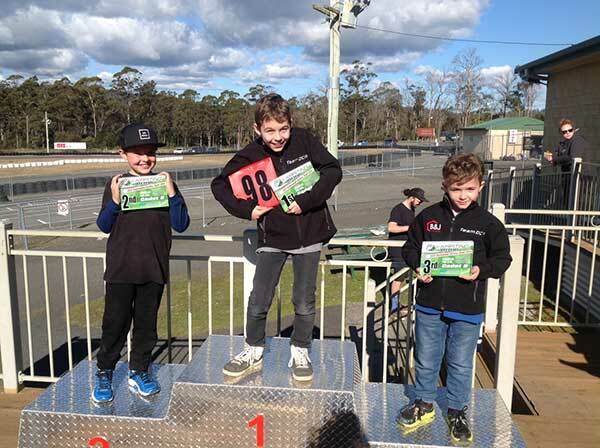 A small group of four greeted the starter with all drivers in their first year of karting. 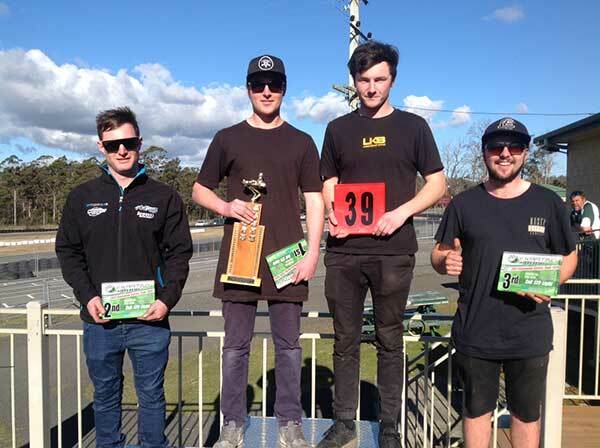 Brothers Rhys and Cameron Jeffrey were tied going into the final round, but it was older brother Cameron who came out on top winning the series as well as the feature on Sunday afternoon. Second on the day went to Kahley Luttrell with Rhys 3rd. A good field of 10 competitors hit the track for the final round with Toby Callow leading by 70 points. Callow was looking to take a clean sweep after claiming qualifying honours and wins in the three heats. But the final was a different story with fellow LKC member William Blair chasing Callow for the whole 15 laps and making the pass to take victory on the final lap, Blair winning his first open race meeting. 3rd went to Elliot Bellars. Callow was hindered during the race with a leaking fuel tank that caused the young driver a bit of discomfort. Callow claim the state wide series title ahead of Darcy Whelan and Blair. The race of the day. The final was a ding-dong battle between three drivers with the winner also claiming the statewide series. 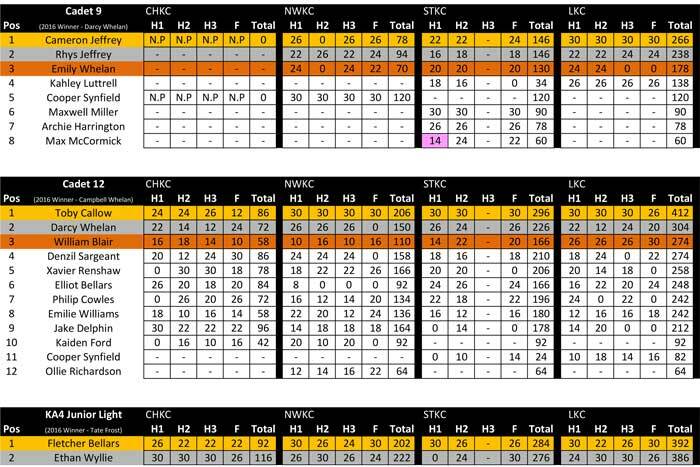 Campbell Whelan, Ethan Wyllie and Fletcher Bellars went into the final separated by just 12 points with 30 points for the win. The three battled it out for the whole 15 laps with passing moves left, right and centre. 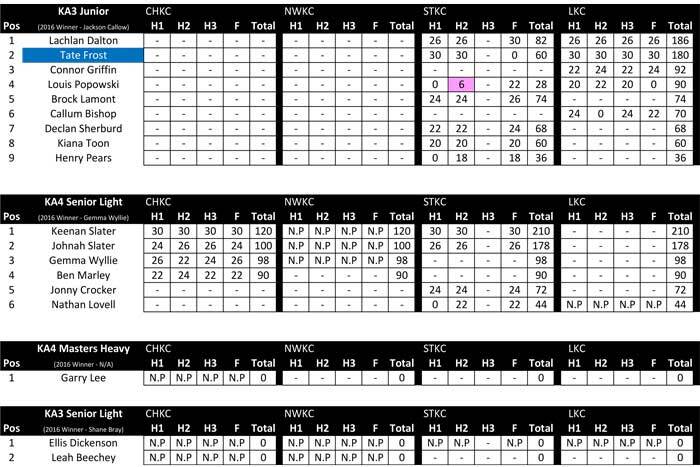 In the end, Bellars got to the front when it counted to take the win and the series ahead of Wyllie and Whelan. 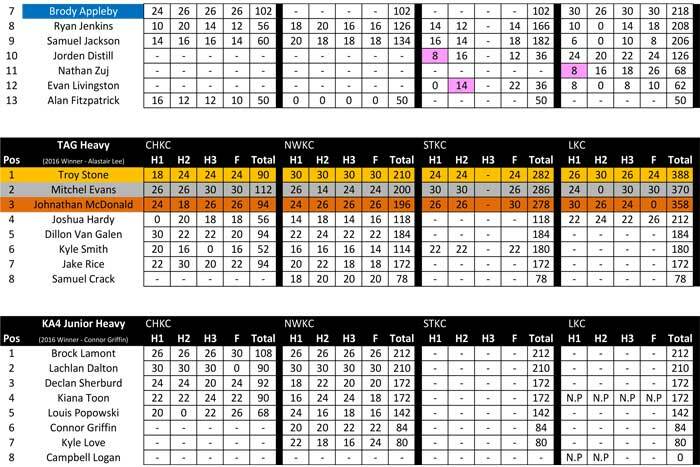 Unfortunately only two drivers started the final round meaning no points were on offer. Kiana Toon took the win in the final. 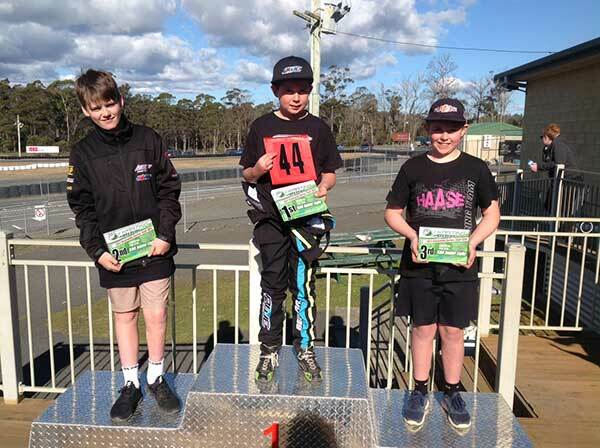 It was again the Tate Frost – Lochie Dalton KA3 show with both drivers at the top of their game here and on the mainland. Frost claimed all the wins on offer ahead of Dalton with the fast improving Connor Griffin third. 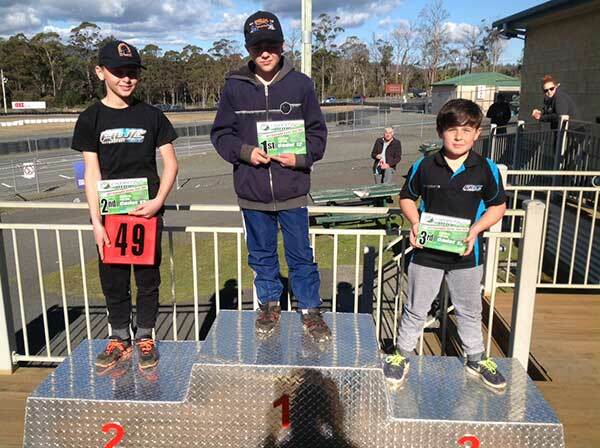 Dalton was leading the points battle but unfortunately the KA3 Junior missed a couple of rounds of the statewide series so no red plate was on offer. 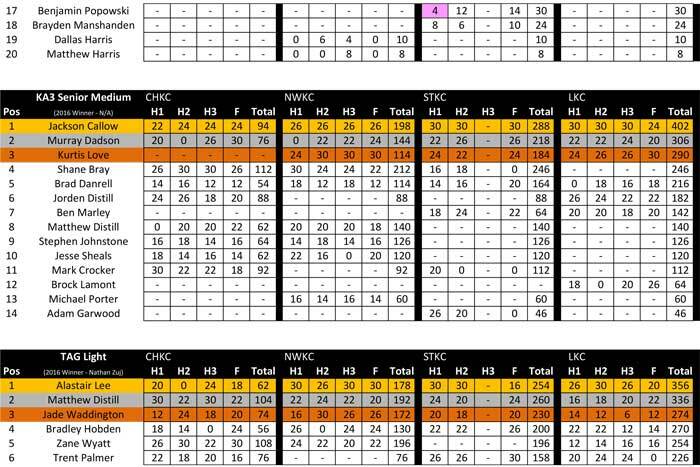 Only one competitor entered the final round in each of these classes with Nathan Lovell (KA4) and Ellis Dickenson (KA3) both claiming wins in the finals which were combined with the heaver classes. There may have only been four drivers in the Masters class but that didn’t stop Tim Hinds and Freddy Cocca battle it out for the win. Both had taken round wins in the series and with only 20 points separating them at the start of the weekend, the red plate was up for grabs. Launceston’s Cocca showed he had the home track advantage over Hinds to claim his first red plate. 2nd went to Hinds with 3rd to Hobart’s Terry Pinfold. A good field of seven drivers started the final round with Jackson Callow leading by a massive 70 points. Callow claimed wins in all heats but in the final Kurtis Love produced the pace to take the win and also secure third in the series. 2nd on the day went to Brock Lamont who stepped up from juniors midweek. 2nd in the series went to Murray Dadson. Hobart’s Harry Ward claimed his third round win when he lead all the way to take out the 15 lap final on Sunday afternoon. 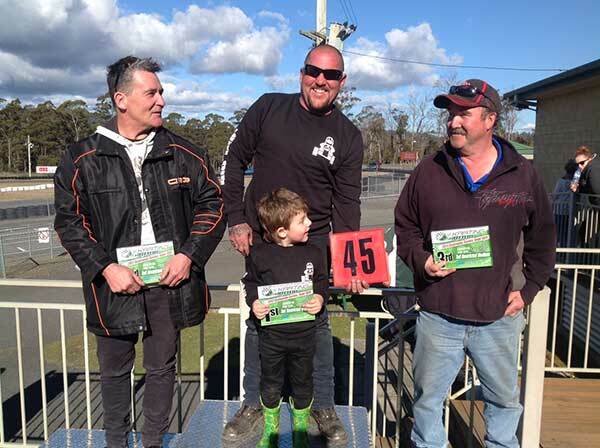 Second went to Launceston’s Andrew Lee who also took 2nd in the series ahead of Brodie Sward with Nicholas Walpole the defending champion relegated to 4th on the day and 3rd in the series. After claiming the win in round three of the series Hobart’s Scott Hildyard headed into the final round red hot favourite for the series and he didn’t let anyone down with convincing heats win and the final to take home the coveted red plate. 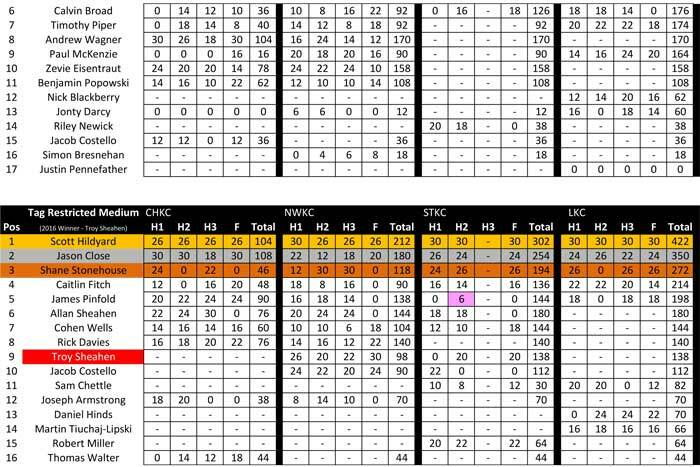 Jason Close finished 2nd on the day and 3rd in the series whilst Shane Stonehouse took 3rd on the day and 2nd overall. 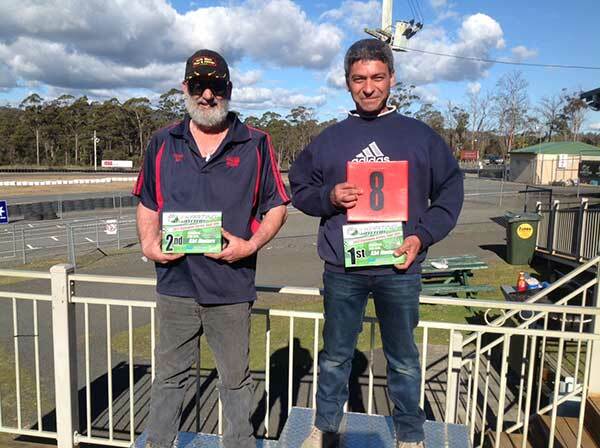 A quality field of twelve of Tasmania’s best drivers hit the track for the final round of the statewide series with Matthew Distill atop the leaders board, his nearest rival Alastair Lee thoogh was only 6 points adrift and the series was a battle of two. Lee got the better of it early when he qualified second behind Hobart’s Brad Hobden whilst Distill could only manage 10th. Lee claimed the heat 2 win and second in the remaining heats to secure the series title, whilst Brody Appleby claimed two heats and the final with Nathan Zuj 2nd and Jorden Distill third on the day. Distill (Matthew) held on to 2nd in the series with Jade Waddington third. 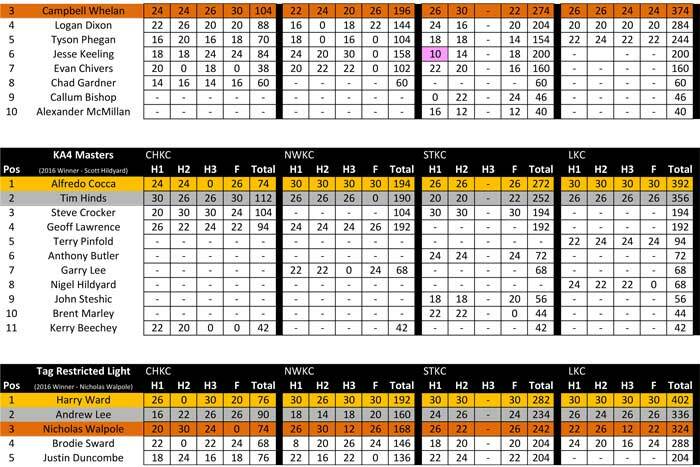 The top three in the series were only separated by 8 points heading into the final round with Mitch Evan leading Troy Stone and Johnathan McDonald third. Heat one saw Evan in the wood chip on the first corner which basically ended his title hopes. When the final rolled round it was Stone who lead McDonald by 6 points, after heat wins were shared between the three. McDonald struck trouble on the roll up laps with a fouled plug and he was unable to get started which handed Stone the series title. In the end Evans won the final ahead of Hobart’s Josh Hardy and Stone third.